On this day in history, May 6, 1743, Seth Warner of the Green Mountain Boys is born. Seth Warner was born in Roxbury, Connecticut and moved to Bennington, Vermont in 1763. Bennington was part of the disputed New Hampshire Grants between New York and New Hampshire, which is today the state of Vermont. New Hampshire began granting settlers tracts of land in the area in the 1740s, but a 1764 Royal verdict gave the land to New York causing New York to invalidate all the New Hampshire grants. New York began seeking the return of the land granted to New Hampshire settlers, who refused to give up their lands. The New Hampshire settlers organized a militia group called the Green Mountain Boys to protect their lands from New York officials and settlers. The Green Mountain Boys were led by Ethan Allen and his cousins, Seth Warner and Remember Baker. They would harass and threaten any New York officials, surveyors or settlers that came into the area. As a leader of the Green Mountain Boys, Warner soon had a price placed on his head by Governor William Tryon of New York. When the American Revolution broke out, the Green Mountain Boys immediately set out on a mission to capture Fort Ticonderoga in New York. The fort was notoriously undermanned and dilapidated, but had a very large store of cannons and artillery. The Green Mountain Boys captured the fort on May 10, less than a month after Lexington and Concord. Warner then went on and captured Fort Crown Point a few days later. For the capture of these two forts, Allen, Warner and the Green Mountain Boys became legends across the colonies. The captured artillery was carried across the mountains by a young Colonel Henry Knox to George Washington at the siege of Boston and used to fortify Dorchester Heights, which caused the British to evacuate the city. The Continental Congress soon authorized a regiment to be made up of Green Mountain Boys. Seth Warner was chosen to lead the regiment in place of Allen, probably because of Allen's legendary temper. The unit was officially called Warner's Regiment. The Regiment served in the invasion of Canada and helped in the capture St. John's and Montreal and with the siege of Quebec. Warner personally led the American rear guard in its retreat from Canada the next spring. In 1777, Warner, now a colonel, participated in the Saratoga campaign, displaying superb leadership in several key battles. 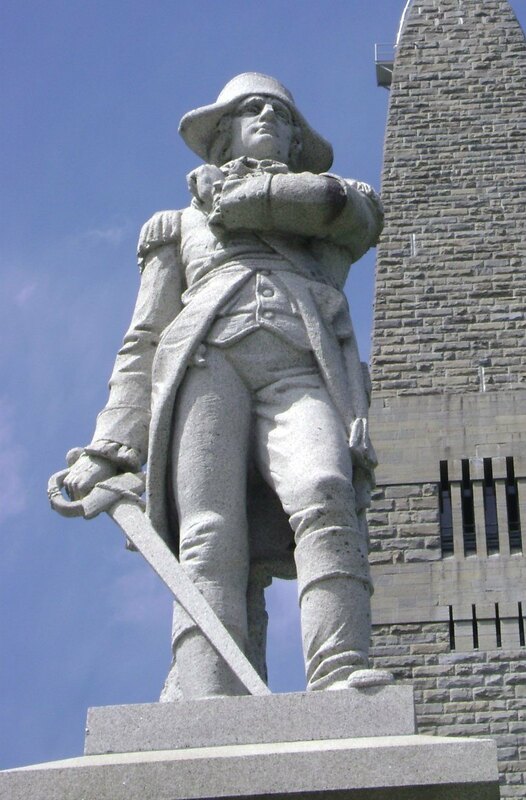 On August 16, he assisted General John Stark in driving the British off at the Battle of Bennington, a feat which earned him a statue at the battle site. Warner was present at the eventual surrender of Burgoyne. In March, 1778, Warner was made a Brigadier General of the Vermont militia. He was quite ill, however, by this time, possibly from arthritis or tuberculosis, and did not spend much time with his troops anymore. As the war shifted to the south, Warner's Regiment was disbanded in 1781 and Warner returned to Roxbury permanently. Warner was in a tough financial position by this time as his finances had largely been neglected during the war. He passed away at the young age of 41 in 1784, leaving his wife and three children, ages 16, 10 and 7. His wife, Esther, petitioned both the federal government and the Vermont government for financial assistance due to her husband's war service. Eventually the Vermont government awarded her 2,000 acres, but the land was rocky and worthless. Warner is buried in Roxbury's Center Green. 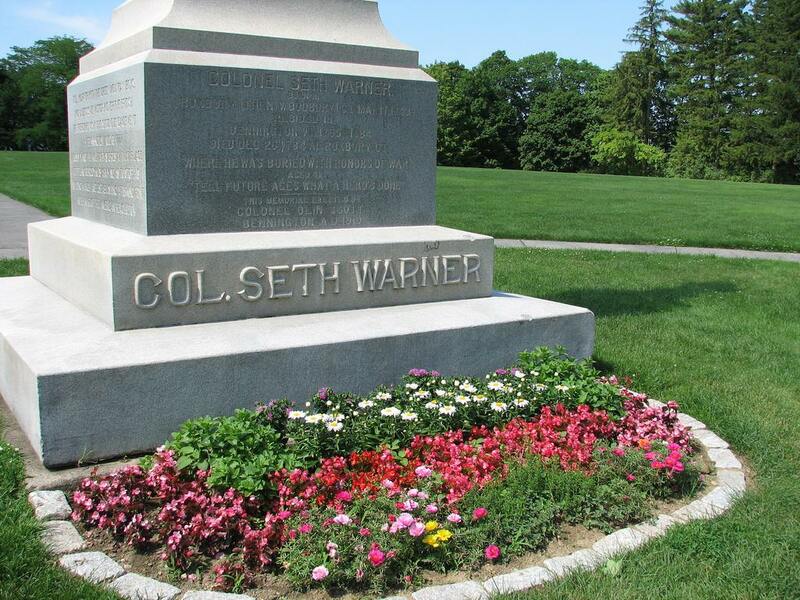 Note: Seth Warner's birthdate is sometimes listed as May 17, 1743. It is May 6 by the Old Style Julian calendar. May 17 by the New Style Gregorian calendar. The British Empire switched to the New Style in 1752.